I was home for a day or so but now I am at another airport about to fly all night, and I would rather be home, or rather be in Boston with my wife. But at least I am not driving home in the ice-storm that started as we approached the airport, like my poor assistant is. There's always that. I'm heading to the UK, where I will do a day of interviews about my Doctor Who episode, and then go and see a sick friend, and then hide out and write for a few days. 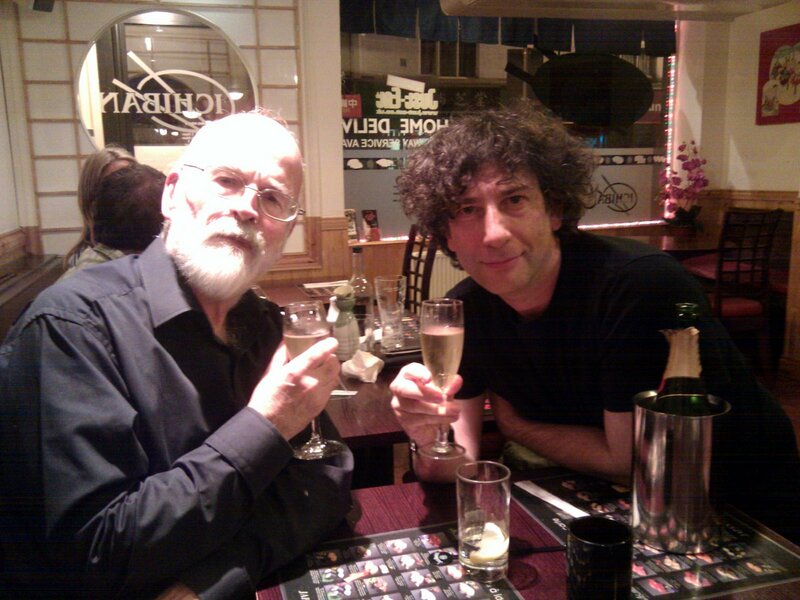 This is a good thing, and why Terry Pratchett and I were drinking champagne last Septemberish. I saw a bunch of press about whether there is or isn't a Sandman TV series: as far as I know, nobody has actually optioned SANDMAN as a TV series from DC Comics, who own it. Eric Kripke (of Supernatural fame) pitched his approach to DC and to me last year, and we liked it and we liked him, but it didn't feel quite right at that point, so we passed. I think that this year the people at DC Comics (and me) will talk to a lot of people who want to make a Sandman TV series, and if we find the perfect person with the perfect way of treating the material, it'll happen. And otherwise it won't. NEVERWHERE is Chicago's One Book. There are a lot of wonderful Neverwhere related events, including two talks from me, a play reading, and a tour of Chicago Below. Details at http://www.chipublib.org/eventsprog/programs/oboc/11s_neverwhere/oboc_11s_greeting.php. I can't do the link as this is from my phone. And I just saw the finished version of my Doctor Who episode. I was happy -- there were moments and even scenes I missed, but that's always the way. Mostly I was just impressed by the performances, direction and music. And effects. They spent money on this one and it shows.